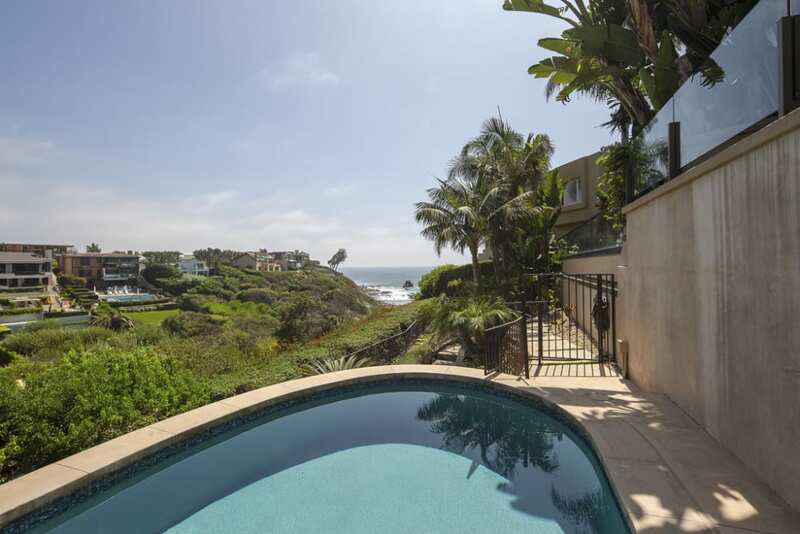 A classic Tuscan style home looking out on the rolling bluff which leads to the ocean, touching Little Corona Beach. Famed Arch Rock is a scenic backdrop for lounging by the pool, dining al fresco or taking in the cool ocean breeze from the more than 2000 sq ft of decks, patios and manicured landscape. This elegant residence is approx. 4100 sq ft, with the main level consisting of 2 bedrooms and 2 ½ bathrooms. Great room with powerful appeal, workout room and garaging for three cars, complete the functional main level. The master suite comprises the entire upstairs, taking advantage of the rugged beauty of the coastline. A 700-bottle wine room is on the lower level adjacent to the fully accommodating guest suite. This home awaits the new owner who regards the authenticity of a Tuscan Villa; or recrafts it utilizing the plans and renderings curated by Geoff Sumich Design. The recrafted home will include the addition of a new 520 sq ft master suite leading to another 1000 sq ft of outdoor space to take in the dramatic Pacific Ocean.